It just gets better and better! These amazing innovative uses for steel shipping containers continue to have far reaching effects on solving business solutions and simplifying business operations. I am always on the look out for cool stories for our industry and I have a great idea to share with you surrounding the temporary pop-up use of conex boxes. When we hear the term ‘pop-up’ it is most often used in the retail segment to describe a test market store often seen in shopping areas to trial a retail concept or seasonal experience. This pop-up is a temporary seasonal or concept idea used across the retail industry. That creative temporary idea has been carried over into the hospitality segment. Think about it. You plan to attend the next SXSW in Austin in 2014, you got tickets to the Super Bowl in another amazing metropolitan city, you are running in the Boston Marathon with a few million others and you need a hotel room. The use of pop-up accommodations to handle the temporary short stay visitors to metropolitan cities across the globe is already happening. 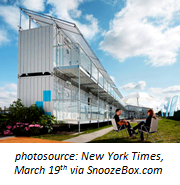 Two such companies Snoozebox and Sleeping Around both utilize steel shipping containers as their base structure and include comfortable accommodations inside. These innovative companies are using 20-foot containers and modifying the existing base steel structure with interior finishing, insulation and plumbing. With additional interior luxuries such as flat screen TVs and Ipod docking stations paired along with queen size beds, these pop-up hotel structures include all the comforts of home. The inherent design of the ISO shipping container allows for stacking easily. These pop-up hotels can literally pop up into 2 story structures easily. Their ability to be placed on just a flat level surface with no foundation required adds to their mobility and flexibility. With the right amount of open space, these innovative hotel rooms can be placed right in the heart of the action for the next overflow or abundance of travelers. Snoozbox has captured the racing market with a complete calendar of events where they will be placing their two story structures right on the straightaway of Silverstone. As the home of the first Grand Prix, this UK racetrack draws thousands of spectators each year. With just a click of a button, you can reserve your conex box hotel room today at Silverstone! Our own industrial living solutions utilizes the same standard containers as the innovative companies above. This workforce living solution has been utilized for a variety of companies offering offsite accommodations for their staff. The design options are varied with our fleet of repurposed shipping containers.